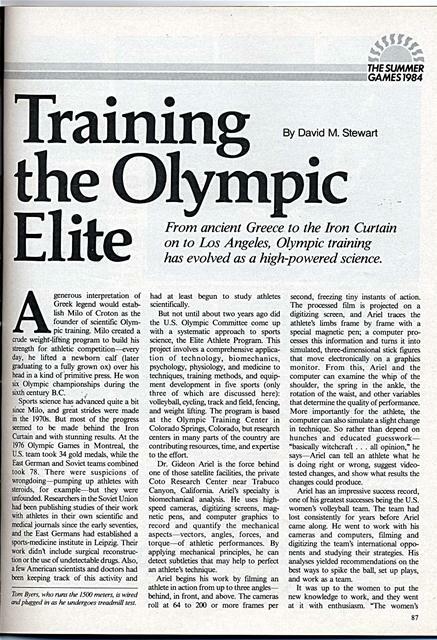 From ancient Greece to the Iron Curtain on to Los Angeles, Olympic training has evolved as a high-powered science. A generous interpretation of Greek legend would establish Milo of Croton as the founder of scientific Olympic training. Milo created a crude weight-lifting program to build his strength for athletic competition-every day, he lifted a newborn calf (later graduating to a fully grown ox) over his head in a kind of primitive press. He won six Olympic championships during the sixth century B.C. 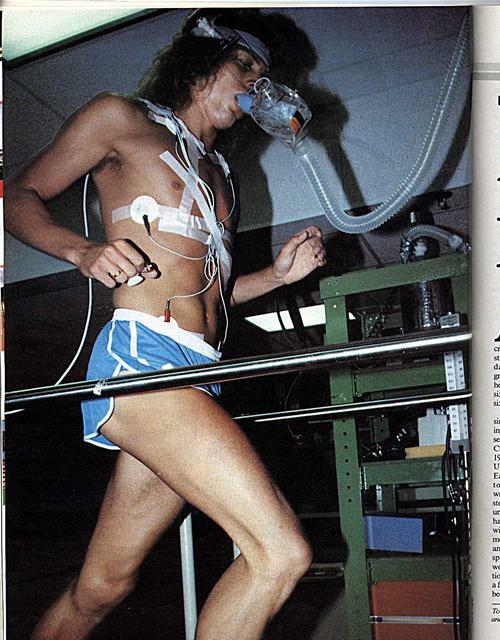 Tom Bvers, who runs the 1500 meters, is wired and plugged in as he undergoes treadmill test. 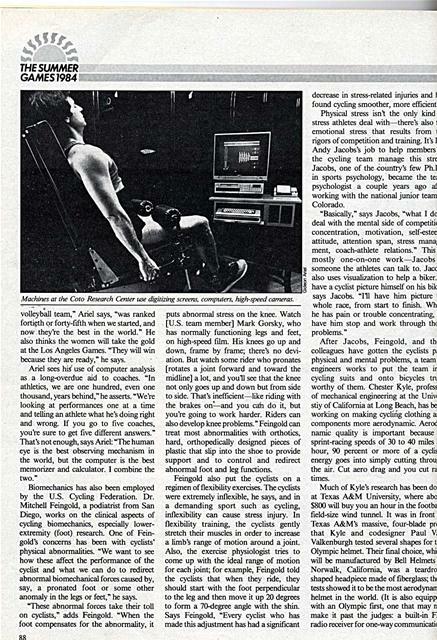 had at least begun to study athletes scientifically. But not until about two years ago did the U.S. Olympic Committee come up with a systematic approach to sports science, the Elite Athlete Program. This project involves a comprehensive application of technology, biomechanics, psychology, physiology, and medicine to techniques, training methods, and equipment development in five sports (only three of which are discussed here): volleyball, cycling, track and field, fencing, and weight lifting. The program is based at the Olympic Training Center in Colorado Springs, Colorado, but research centers in many parts of the country are contributing resources, time, and expertise to the effort. Dr. Gideon Ariel is the force behind one of those satellite facilities, the private Coto Research Center near Trabuco Canyon, California. Ariel's specialty is biomechanical analysis. He uses highspeed cameras, digitizing screens, magnetic pens, and computer graphics to record and quantify the mechanical aspects-vectors, angles, forces, and torque-of athletic performances. By applying mechanical principles, he can detect subtleties that may help to perfect an athlete's technique. second, freezing tiny instants of action. The processed film is projected on a digitizing screen, and Ariel traces the athlete's limbs frame by frame with a special magnetic pen; a computer processes this information and turns it into simulated, three-dimensional stick figures that move electronically on a graphics monitor. From this, Ariel and the computer can examine the whip of the shoulder, the spring in the ankle, the rotation of the waist, and other variables that determine the quality of performance. More importantly for the athlete; the computer can also simulate a slight change in technique. So rather than depend on hunches and educated guesswork"basically witchcraft . . . all opinion," he says-Ariel can tell an athlete what he is doing right or wrong, suggest videotested changes, and show what results the changes could produce. Ariel has an impressive success record, one of his greatest successes being the U.S. women's volleyball team. The team had lost consistently for years before Ariel came along. He went to work with his cameras and computers, filming and digitizing the team's international opponents and studying their strategies. His analyses yielded recommendations on the best ways to spike the ball, set up plays, and work as a team. Machines at the Coto Research Center use digitizing screens, computers, high-speed cameras. volleyball team," Ariel says, "was ranked fortieth or forty-fifth when we started, and now they're the best in the world." He also thinks the women will take the gold at the Los Angeles Games. "They will win because they are ready," he says. Ariel sees his use of computer analysis as a long-overdue aid to coaches. "In athletics, we are one hundred, even one thousand, years behind," he asserts. "We're looking at performances one at a time and telling an athlete what he's doing right and wrong. If you go to five coaches, you're sure to get five different answers." That's not enough, says Ariel: "The human eye is the best observing mechanism in the world, but the computer is the best memorizer and calculator. 1 combine the two." Biomechanics has also been employed by the U.S. Cycling Federation. Dr. Mitchell Feingold, a podiatrist from San Diego, works on the clinical aspects of cycling biomechanics, especially lowerextremity (foot) research. One of Feingold's concerns has been with cyclists' physical abnormalities. "We want to see how these affect the performance of the cyclist and what we can do to redirect abnormal biomechanical forces caused by, say, a pronated foot or some other anomaly in the legs or feet," he says. puts abnormal stress on the knee. Watch [U.S. team member] Mark Gorsky, who has normally functioning legs and feet, on high-speed film. His knees go up and down, frame by frame; there's no deviation. But watch some rider who pronates [rotates a joint forward and toward the midline] a lot, and you'll see that the knee not only goes up and down but from side to side. That's inefficient-like riding with the brakes on'-and you can do it, but you're going to work harder. Riders can also develop knee problems." Feingold can treat most abnormalities with orthotics, hard, orthopedically designed pieces of plastic that slip into the shoe to provide support and to control and redirect abnormal foot and leg functions. decrease in stress-related injuries and h found cycling smoother, more efficient. Physical stress isn't the only kind stress athletes deal with-there's also t emotional stress that results from t rigors of competition and training. It's L Andy Jacobs's job to help members the cycling team manage this sire Jacobs, one of the country's few Ph.I in sports psychology, became the tea psychologist a couple years ago afl working with the national junior team Colorado. "Basically," says Jacobs, "what I do deal with the mental side of competitic concentration, motivation, self-esteei attitude, attention span, stress manal ment, coach-athlete relations." This mostly one-on-one work-Jacobs someone the athletes can talk to. Jaco also uses visualization to help a biker. have a cyclist picture himself on his bika says Jacobs. "I'll have him picture t whole race, from start to finish. WhE he has pain or trouble concentrating, 1 have him stop and work through the problems." After Jacobs, Feingold, and the colleagues have gotten the cyclists pz physical and mental problems, a team engineers works to put the team in cycling suits and onto bicycles tru worthy of them. Chester Kyle, profess of mechanical engineering at the Unive stiy of California at Long Beach, has beE working on making cycling clothing ar components more aerodynamic. Aerod namic quality is important because sprint-racing speeds of 30 to 40 miles i hour, 90 percent or more of a cyclic energy goes into simply cutting throw the air. Cut aero drag and you cut ra times. with the coaching staff.) To make the Olympic racing bikes more aerodynamic, Kyle and his associates have been developing or adapting flat spokes, teardrop-shaped rims, and nearly flat or recessed nuts and bolts. Mike Melton, of the Huffy Corporation, using results from Kyle and company's wind-tunnel research to guide his efforts, is working on frame designs using ovular (egg-shaped) tubes and smaller overall sizes. These details barely scratch the surface of the work being done in cycling by the Elite Athlete Program. 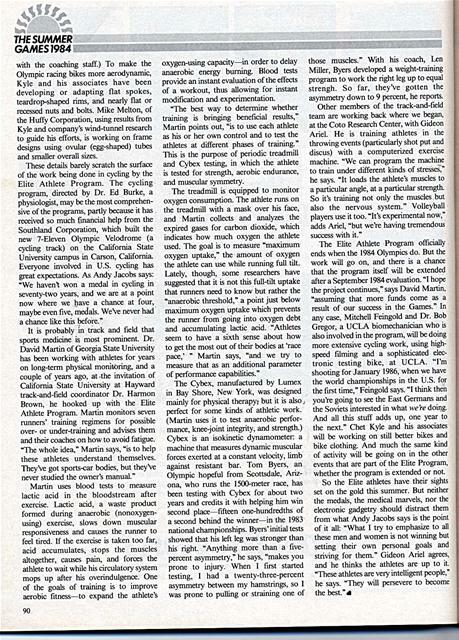 The cycling program, directed by Dr. Ed Burke, a physiologist, may be the most comprehensive of the programs, partly because it has received so much financial help from the Southland Corporation, which built the new 7-Eleven Olympic Velodrome (a cycling track) on the California State University campus in Carson, California. Everyone involved in U.S. cycling has great expectations. As Andy Jacobs says: "We haven't won a medal in cycling in seventy-two years, and we are at a point now where we have a chance at four, maybe even five, medals. We've never had a chance like this before." It is probably in track and field that sports medicine is most prominent. Dr. David Martin of Georgia State University has been working with athletes for years on long-term physical monitoring, and a couple of years ago, at,the invitation of California State University at Hayward track-and-field coordinator Dr. Harmon Brown, he hooked up with the Elite Athlete Program. Martin monitors seven runners' training regimens for possible over- or under-training and advises them and their coaches on how to avoid fatigue. "The whole idea," Martin says, "is to help these athletes understand themselves. They've got sports-car bodies, but they've never studied the owner's manual." oxygen-using capacity-in order to delay anaerobic energy burning. Blood tests provide an instant evaluation of the effects of a workout, thus allowing for instant modification and experimentation. "The best way to determine whether training is bringing beneficial results," Martin points out, "is to use each athlete as his or her own control and to test the athletes at different phases of training." This is the purpose of periodic treadmill and Cybex testing, in which the athlete is tested for strength, aerobic endurance, and muscular symmetry. The treadmill is equipped to monitor oxygen consumption. The athlete runs on the treadmill with a mask over his face, and Martin collects and analyzes the expired gases for carbon dioxide, which indicates how much oxygen the athlete used. The goal is to measure "maximum oxygen uptake," the amount of oxygen the athlete can use while running full tilt. Lately, though, some researchers have suggested that it is not this full-tilt uptake that runners need to know but rather the "anaerobic threshold," a point just below maximum oxygen uptake which prevents the runner from going into oxygen debt and accumulating lactic acid. "Athletes seem to have a sixth sense about how to get the most out of their bodies at 'race pace,' " Martin says, "and we try to measure that as an additional parameter of performance capabilities." those muscles." With his coach, Len Miller, Byers developed a weight-training program to work the right leg up to equal strengh. So far, they've gotten the asymmetry down to 9 percent, he reports. Other members of the track-and-field team are working back where we began, at the Coto Research Center, with Gideon Ariel. He is training athletes in the throwing events (particularly shot put and discus) with a computerized exercise machine. "We can program the machine to train under different kinds of stresses," he says. "It loads the athlete's muscles to a particular angle, at a particular strength. So it's training not only the muscles but also the nervous system." Volleyball players use it too. "It's experimental now," adds Ariel, "but we're having tremendous success with it." 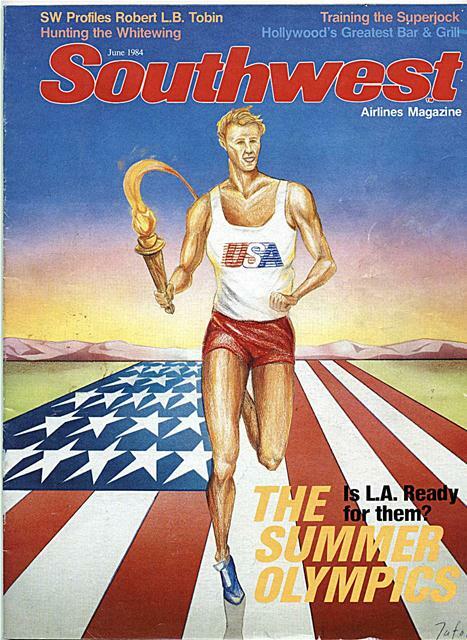 The Elite Athlete Program officially ends when the 1984 Olympics do. But the work will go on, and there is a chance that the program itself will be extended after a September 1984 evaluation. "I hope the project continues," says David Martin, "assuming that more funds come as a result of our success in the Games." In any case, Mitchell Feingold and Dr. Bob Gregor, a UCLA biomechanician who is also involved in the program, will be doing more extensive cycling work, using highspeed filming and a sophisticated electronic testing bike, at UCLA. "I'm shooting for January 1986, when we have the world championships in the U.S. for the first time," Feingold says. "I think then you're going to see the East Germans and the Soviets interested in what we're doing. And all this stuff adds up, one year to the next." Chet Kyle and his associates will be working on still better bikes and bike clothing. And much the same kind of activity will be going on in the other events that are part of the Elite Program, whether the program is extended or not. Generated on 4/20/2019 3:12:27 PM (PST) ADI/HQ/GBA/2019/ARIELCLOUD/v3.0.2018.0126.